Maplewood chiropractor Bill Madosky says maps can be dangerous. A Natchez Trace Parkway map hung in his office for years, and it finally led to a five-day bike trip on the road. Madosky is at the southern terminus of the Natchez Trace, at the end of his ride. Madosky, 61, has had a long-time goal to bicycle the length of the Mississippi River, which he’s been working at in pieces for 15 years. This summer he finally ticked off a large part of that goal by biking the Natchez Trace, from Nashville, Tennessee, to Natchez, Mississippi. He said he rode the KATY trail from Clinton to St. Charles, but never anything as long as the 444-mile trip along the Mississippi, which took him five days. Other than some saddle-soreness he had no problems with the distance. The U.S. government shutdown made the ride more challenging than he expected. There are no stoplights or stop signs the entire route. “All the facilities on the route were closed,” he said “I couldn’t even get water.” Fortunately Madosky’s wife and a friend provided support along the way in a van, meeting up with him three times a day. He slept in hotels off the trail in cities along the way. Northern vs. Southern accents were also an unexpected challenge. Madosky loved the view of the Tennessee River as he crossed over it. He also learned that Tupelo honey doesn’t come from Tupelo, Mississippi. Mile marker 442 is at the northern end of the route. He said he ate lots of peanut butter and jelly sandwiches, and added on a trip like this he didn’t have to worry about gaining weight. The the terrain was hilly, but not much elevation difference from start to finish. 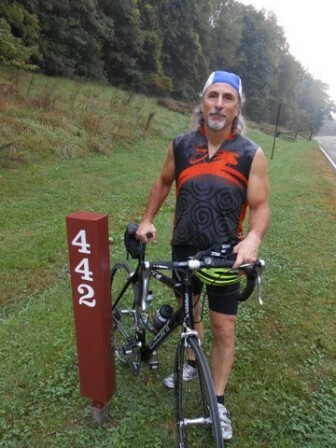 Madosky’s next goal is to bike the Blue Ridge Parkway.